PARIS/TOKYO (Reuters) - The boards of Renault <RENA.PA> and Japanese partner Nissan <7201.T> met on Thursday for an update on ongoing investigations surrounding alleged financial misconduct by alliance boss Carlos Ghosn, both companies said. Nissan, which ousted Ghosn as chairman days after his Nov. 19 arrest, said in a statement it remained committed to the alliance in the wake of the scandal that has strained ties with its French 43.4-percent owner. At their own informal meeting, Renault directors were updated on the company's compliance investigation, which is verifying payments to top executives. 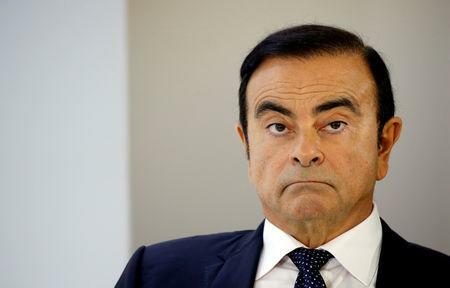 Renault, unlike Nissan, has maintained Ghosn as its chairman and chief executive, citing the presumption of innocence. Ghosn and senior Nissan director Greg Kelly have been charged in Japan with failing to disclose $43 million in additional compensation for 2010-15 that Ghosn had arranged to be paid later. Both men deny the deferred compensation agreements were illegal or required disclosure. The board meetings came a day before Japanese prosecutors were expected to indict the Renault boss and former Nissan <7201.T> chairman on more charges. Nissan said its board had agreed on new interim processes for setting executive pay and increasing the range of company decisions requiring board discussion, as part of a drive to improve governance. Renault compliance chiefs also briefed the company's board at Thursday's meeting on a review underway of executive committee members. The compliance probe has so far examined compensation records for 2017-2018 and "has concluded that it is both in compliance with applicable laws and free from any fraud", the company said. Ghosn, who remains in detention, is likely to be formally charged with aggravated breach of trust for temporarily transferring personal investment losses to Nissan in 2008, and for understating his compensation for three more years through 2018, a person with knowledge of the matter said earlier. A member of his Japan-based legal team earlier told Reuters that Ghosn, 64, did not attend an interrogation session scheduled for Thursday due to a fever, and that he had been advised by a detention center physician to rest. Carole Ghosn, the ousted Nissan chairman's wife, released a statement on Thursday pleading with Japanese authorities for more information about her husband's health. "I recently learned that my husband is suffering from a high fever at the detention center in Tokyo, but my information is limited to news reports as no one in his family has been allowed to contact him since November 19," she said. She said Japanese authorities have not provided Ghosn's relatives with details about his treatment or condition, nor allowed them to speak to medical personnel at the detention center. "We are fearful and very worried his recovery will be complicated while he continues to endure such harsh conditions and unfair treatment," she added. Ghosn said he was "wrongly accused and unfairly detained based on meritless and unsubstantiated accusations" during a court proceeding earlier this week, the car executive's first public appearance since his November arrest.